Hey! I got some Halloween decorations out more than 10 days before Halloween! Usually it ends up being the day before Halloween and we decide it really isn’t worth it. I was subjected to some guilt-inducing moments, though. As the boys were putting out our various knick-knacks I heard them say things like “I’m so excited” and “This is my favorite time of the year” — I hope they don’t look back on their childhood as a time of disappointment in a Mom who didn’t have her holiday decorating act together. 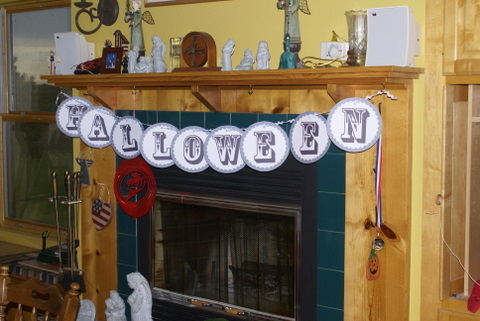 What started me on my spurt of holiday cheer was finding this cute banner on a blog on Saturday. (The blog is Allsorts, here’s the direct link the post with the letters for the banner . I need to go back and straighten out the rick-rack so that the letters lay flatter. We bought some pumpkins the other night, the boys have been asking to carve jack-o-lanterns this year. My husband claims that the boys and I carved pumpkins last year, but I have absolutely no recollection of that. I can’t seem to find any photographs, which seems odd — wouldn’t you think I would take pictures if I had gone to all of the work of carving pumpkins? I’m not sure when we are going to tackle that. I want to find a recipe for roasting the seeds. My husband says he’s never had roasted pumpkin seeds before. Halloween is not his favorite holiday — I think we could skip right past it and he’d be just fine. The boys though: they talk about Halloween and Halloween costumes all year long. Every week or so someone will say “I’m going to be XYZ this year.” And I will say “That’s nice, honey.” And I’ll know that next week XYZ will be ABC and the week after it will be LMNOP. And I can guarantee you that that conversation will start on approximately November 1st. 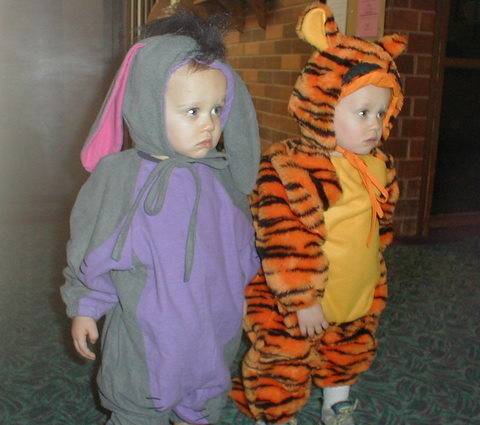 As I was attempting to fall asleep last night I started thinking about Halloween memories from when I was a kid. I don’t remember all of my Halloween costumes — I do remember in 3rd grade I was a Fairy Godmother and had the silliest get-up — it involved a pink tutu and I don’t know what else. For several years we lived next to a family that became very close friends (back in May my Mom and I went to the wedding blessing for the daughter of the family). The daughter was Princess Leia for several years — it seems like they may have even had to buy her a 2nd (bigger) costume as the years went by. Our Dad’s were in the Navy and often out to sea, but I remember several Halloween’s when they were both home at the same time and the Dad’s were the ones that took the 5 of us kids trick-or-treating. They brought their mugs with them — I think there were several homes in our neighborhood that had hot cider available for the grown-ups. Now that I’m a grown-up, I wonder — do you suppose that cider had anything “extra” in it? Look at them! It doesn’t get a whole lot cuter than that. I made those big enough that they actually wore them the next year, as well. I’ve enjoyed seeing Halloween costumes on other people’s blogs — I’d love to hear more about Halloween memories and stories! Passion is a big part of your life, which makes sense for a pirate. Even though you’re not always the traditional swaggering gallant, your steadiness and planning make you a fine, reliable pirate. Arr! Even if you don’t want a pirate name of your own, this quiz itself is quite funny. At least, I thought it was. But then, I’m easily amused. I’m also apparently not able to actually talk like a pirate. I don’t know what happened to Thursday. I can’t even remember what I did yesterday. Not much apparently. Today was spent making the rounds of some gifty/deco/knick-knack kind of places. Several were having Fall Open Houses, so I went with several friends to check things out. Amazingly, nothing coming home with me. Part of the problem is that I’m really terrible about decorating. For one thing, I have a hard time spending money on things that just sit and look pretty. I love going to houses that are beautifully appointed, with vases, and interesting bowls of things, and displays of unique items, but I just don’t seem to have the gene that would enable me to recreate that in my own house. Our decorations are either every day stuff or it is the Christmas stuff. I don’t seem to be able to manage anything else. We have some Halloween stuff, but I usually don’t think about it until October 30th. By then, it doesn’t seem worth the effort. The other problem is that I find that I don’t even notice the stuff that’s on my walls. Yes, that would be a Christmas decoration. 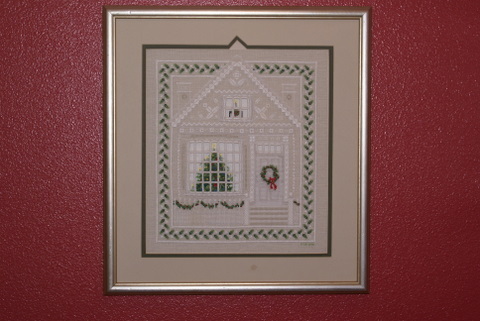 Back before I started quilting, I was an avid cross stitcher. 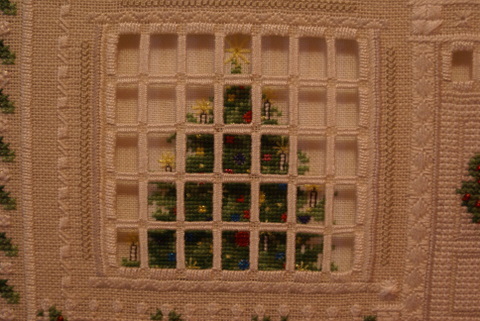 This particular piece was particularly intricate, as it is actually 2 layers — with cutwork on the top layer of the “house,” so that you can see the tree behind the window, as well as a candle in the upstairs window. What I’ve decided is that I’m EARLY for Christmas 2007. So, I was looking through drafts of posts that I had started and never actually posted, and deleting most of them, when this one caught my fancy. Have I mentioned that I’m in a weird mood this week? 2. Turkey or Ham? I almost hate to say this, but last year: neither. We had homemade, make-your-own pizzas on Christmas day….yum. 3. Does Santa wrap presents or just set them under the tree? Growing up, Santa did not wrap. Each kid’s stocking and Santa presents were displayed in a chair. When my husband was growing up, Santa always wrapped. After we had kids we decided to go with wrapping the Santa gifts. Santa uses a special paper featuring himself, all the other presents are in other kinds of paper. 4. Colored lights or white on the tree? Inside on the tree: can be both. Outside: has to be white. 5. Do you get a fake or real-you-cut-it-yourself Christmas tree? We switched to fake several years ago. I miss the smell of a real tree, but not the dripping needles, potential fire hazard, or the fact that I was allergic to the sap. 6. Favorite Christmas song? Only one? White Christmas — Bing Crosby. 8. What is your favorite holiday dish? Broken Glass Salad — Grandma used to make it, her mom used to…now it’s my job. Four different colors of jello, mixed up with a Cool Whip/gelatin mixture, topped with crushed Nilla wafers (that have been mixed with more sugar and butter…) Yum. But why are Jello dishes called Salad??? 9. When is it too early to start listening to Christmas music? Any time before December 1st. I love Christmas music, but give me a break, already! 10. What is your favorite holiday smell? Fresh baked peanut butter cookies. 11. When and how did you learn the truth about Santa? When I was 7. Older boys at school. 12. What kind of decorations are on your Christmas Tree? All kinds of stuff. Homemade, store bought, old, new…. 13. Do you open a present or presents on Christmas Eve, or wait until Christmas Day? New jammies on Christmas Eve, everything else Christmas Morning. 14. Go to someone else’s house or they come to you? Depends. We’ve gone to Florida to see my Dad, we’ve stayed home, we’ve gone over to relatives, we’ve had family come to us…. 15. Which do you prefer giving or receiving? Does anybody actually answer receiving? For a funny 4th of July cartoon, you should go visit Savage Chickens . 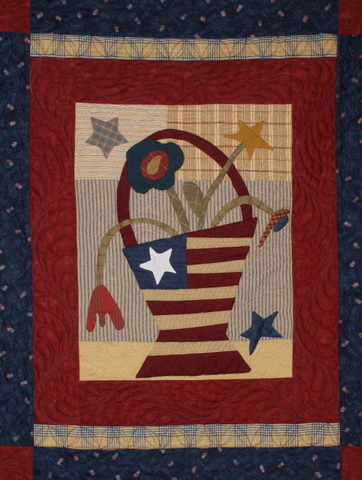 (Quilt is a Country Threads pattern called Firecracker Bouquet, hand appliquéd and machine quilted by me in 2005). I’m off for a short family vacation, stay tuned for some previously scheduled posts!